Nineteen eighty five is Sir Clive Sinclair’s forty fifth year, and sees him personally worth well over £100 million. His name is emblazoned on the covers of over 5,000,000 computers which have been sold all over the world, and he has the majority holding in Sinclair Research, now the top volume microcomputer company in the world. Every other home computer sold in the United Kingdom is a Sinclair. We begin a four-part series which examines the man, the dream and the machines from which millions draw pleasure every day. ‘Sinclair’ has become a household name worldwide through the ZX80, the first affordable home computer, the ZX81 and of course the ZX Spectrum — without which CRASH and a vast software industry wouldn’t have come into being. And Sir Clive himself is now regarded as something of a guru — not just because he can be looked upon as the founding father of home computing in this country, but as a result of his entrepreneurial skills and his dedication to innovation. Sir Clive has described his business as being ‘in consumer products that are basically electrical — one per person products’, and the jump from computers to electric vehicles, seen in this light, is not so amazing. Sir Clive Sinclair is now almost a figure of popular myth and has been referred to as ‘Uncle Clive’ by the press for nearly a decade. He is to computers and electronic wizardry what Sir Freddie Laker was to air travel — the man who brought seemingly unattainable goods and services within the price range of everyone. Laker’s airline crashed spectacularly a few years ago, and out of the public eye, Sir Freddie is almost forgotten. But Sir Clive remains in a strong commercial position although his image as a white entrepreneurial knight has been tarnished on occasions. He may want to forget such fiascos as the late delivery of QLs, which led him to being pilloried by journalists in the computer press; or earlier, the serious financial problems caused by his Black Watch project in the mid-seventies which resulted in losses of over £350,000 and led to him looking for outside funding to continue with his pocket TV project. But so far, he has always managed to have the last laugh, never so much so than at the expense of his ‘arch-rival’ and ex-colleague in calculator designing days, Chris Curry. Curry, who founded Acorn and secured the contract to make the BBC computer, recently referred to allegations of extraordinarily high rates of return on Spectrums, which led to a dust-up in a London wine bar where the two tycoons slugged it out with rolled newspapers. But just after Christmas Curry found himself at the helm of a sinking ship. From the earliest days, Clive Sinclair has done business through mail order and from the start he offered an unconditional money-back guarantee to his customers — before it became a legal requirement. Sinclair products are generally made using sub-contractors, freeing the core of talent behind the Sinclair organisation to dream up new products and designs, but it also means that quality control has taken a while to stabilise at the outset of each product. Nevertheless, the Sinclair name has attracted a large following of guinea pigs, eager to be the first to own the latest piece of hardware first, even if it does mean putting up with a few teething problems. In less than thirty years Clive Sinclair has progressed from school-leaver with few formal qualifications to multi-millionaire electronics tycoon. How did he do it? While he was still at school, in London, he became interested in mathematics, still his first love, and physics. At that time the electronics industry was beginning to make semiconductors available to the public and he became involved in electronics at a time when new developments were being made in the field almost daily. At school he tinkered with radios while his chums just listened to them. He began writing articles on the subject, and when he was 17 Clive Sinclair decided that a university course in electronics could not teach him the sort of things he wanted to know at the rate he wanted to learn. In 1957, deciding that he would rather start a business than continue his formal education, the young school-leaver became a technical journalist working for Barnes Publications for whom he wrote a series of small books for the hobbyist — learning far more in the process of writing them than any of his readers could hope to gain from reading them. Then he found financial backing to start making pocket radios to his own design, and left Barnes. His backer lost heart, pulling out, and for a while he worked as a freelance technical journalist trying to raise the money to launch his idea as products. After some months with resources depleted, he sought a full-time employment once more, and was snapped up by United Trade Press as Assistant Editor of Electronic Components. His knowledge and understanding of electronics had a marked effect on the magazine’s circulation and advertising revenue. From the start Clive Sinclair’s colleagues had been impressed by his incredible calm maturity and he was liked and respected enormously. He worked on his aim of selling mail order radios in his spare time, and when he gave in his notice, announcing that he was going off to start a business, United Trade Press was very sorry to be losing him. So they came to an arrangement by which he was allowed the use of a vacant office on the third floor of the building without charge in return for further articles for the magazine. For a few months this arrangement helped Clive Sinclair find his feet in the mail order market, supplying radio kits, but then the office became too small for the head of the rapidly growing Sinclair Radionics, and Clive Sinclair ceased to be a journalist and became a full time businessman. ‘The Slimline’ was Sinclair’s first radio kit but he rapidly followed it up with a tiny amplifier module. In the beginning products were designed by Clive Sinclair himself. The range included an amplifier which has become known as ‘the biscuit tin amplifier’. The X10 and X20 tended to radiate which was a bit of a problem unless they were shielded — and a biscuit tin was ideal for the purpose. In 1967 the growing business empire moved to Cambridge, where it has been ever since, shortly after producing the Z-12, a tiny hi-fi amplifier and pre-amp. Soon a turnover of £100,000 had been achieved — no mean feat in five years largely funded on the electronics hobbyist market. Sinclair was also active in the electronics instrument field, launching the DM2 multimeter in the early seventies and becoming the largest manufacturer of digital multimeters in Europe in little more than five years. He broke away from the hobbyist and hi-fi market in 1972 with the launch of a single chip calculator which was born after six months research, and was pocket-sized as opposed to hand held. Using the same PMOS chip as the American hand held calculator, which required large batteries owing to the heavy demand the PMOS chip made on its power supply, Sinclair found a way of cutting the power consumption by about 20 times. This meant that a truly hand held calculator was possible; Sinclair Radionics made it and started the calculator boom with ‘The Executive’, earning £2.5 million in export revenue alone. At the time, Sinclair had a staff of about 60. By 1977 Sinclair had become world famous as a calculator manufacturer, and the ‘Cambridge’ programmable outsold all programmable and scientific calculators. The Sinclair philosophy of sub-contracting the actual production of his wares, buying in the components and paying sub-contractors to assemble them, contributed greatly to his success. He was left free to concentrate on research and development, and he was able to recruit a talented team of ‘inventors’ — including Chris Curry (latterly of Acorn fame) who has been held responsible for interesting Sinclair in calculators and computers. But the launch of his Black Watch in 1975 resulted in a disaster. The watch used a new type of chip — integrated injection logic — which ran on low power but was capable of switching the high power required to drive the display. Sinclair spotted that this type of chip, invented by IBM and Phillips, was ideal for watches — and devised the circuitry required to incorporate it. He produced the first production integrated injection logic chip in the world — ahead of its inventors — but the watch project ran into problems at his chip suppliers who weren’t able to deliver the goods. 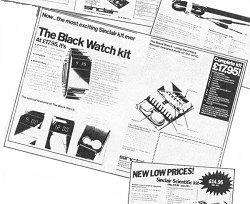 Eventually Black Watches were made in a version which used CMOS chips, but by then Sinclair could no longer hold the price in what was a highly competitive watch market. A loss of some £355,000 was sustained in 1976. Having previously funded research and expansion from his own profits, Sinclair was faced with scrapping many years work on a pocket TV project. He approached the National Enterprise Board for cash and sold 43% of the shares in the company. The NRDC put up £700,000 for development to continue on the pocket TV. By 1977 Sinclair had moved entirely out of the hi-fi market, continuing with digital meters and calculators; and the pocket TV with a 2-inch picture tube (you had to have a fairly large pocket!) was launched, achieving major sales in the United States. 40% of Sinclair’s turnover was attributable to TVs, 40% to calculators and 20% to meters. In 1978 the ‘Microvision’ was marketed in Europe, and in Britain — where it had been sold initially for £220 plus VAT — the price was halved. 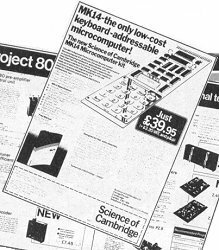 Early in 1978 the first Sinclair computer came on the market — very much the forerunner of the ZX80 with its membrane keyboard. Costing £40 it had 256 bytes of RAM, a half K of ROM which held a monitor, and didn’t have a box! Powered by a 6v lantern battery, it was a true computer, not an upgraded calculator and was advertised as being ‘less than half the price of any keyboard addressable microcomputer’. The MK14, for such it was, had a very early 8 bit processor, the SCMP or ‘SCAMP’, which was programmed in machine code — although a very tiny BASIC soon became available. And the manual included a program for ‘Lunar Lander’ — the very first game playable on a Sinclair computer! In 1979 Sinclair and the NEB parted company. They wanted to concentrate on meters while Clive Sinclair was attached to the TV project. Left to his own devices again, Sinclair founded Sinclair Research, the company which became responsible for the low-cost home computer. Next month: from the ZX80 via microdrives and interfaces to the ZX Spectrum and the QL.